With the historically low unemployment rate in the USA, finding new employees may feel like an unending revolving door of searching, interviewing and hiring talent for your small business. I refer to employees as talent, because when hiring is done properly, your new associates should feel like valued members of your team regardless of their position. If you are a small business owner and one of your many roles is Human Resources Manager, the best way to end the revolving door of hiring is to keep the people you employ for the long term. There are simple ways to engage your new employees and have them add value and improve your business from the start. According to SHRM, the average new hire costs $4,128 and requires 42 days to fill a position, which means additional expenses in lost productivity. With these staggering numbers, you want to be sure your hiring decisions are good ones and that the employees you hire will be with you for more than a few months. 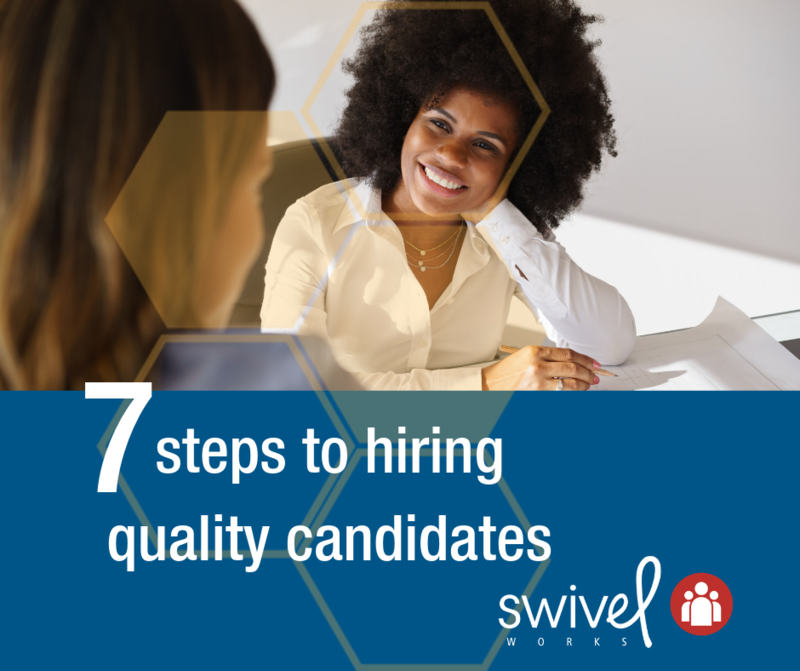 To assure the employees you bring into your small business add value to your business use these seven simple steps to find, hire and retain quality candidates. 1. Find the right candidates. There are so many job boards where you can place an advertisement for your open positions, it may feel overwhelming just to identify the best ones for your business. Determining your ideal candidate and placing your ads where these potential employees are actually looking is crucial to your success. Are you looking for an entry level trainee? CollegeRecruiter.com might be a good place to start. Indeed.com is a great resource to place your ad as well as search for posted resumes of those looking to make a career move. For maximum results place your ad on a variety of job boards, LinkedIn , Craigslist as well as utilizing your social media for more localized candidates. Even with low unemployment, you may find yourself reviewing and reading 50-75 resumes, which can be exhausting and draining. Identify the top qualifications that the position requires and narrow your focus on the resumes that show competency in those requirements. While experience should not be your only guidelines for finding the perfect person to fill your openings, it is helpful in quickly identifying candidates. Once you have narrowed the field, start with pre-qualifying telephone interviews or a short video conference call to further vet your candidates. Be sure you ask meaningful interview questions regarding the candidates work history. Be ready to ask for examples of how the individual performed in previous positions and ask them to share any positive results they attained due to their decisions or actions. Ask for business and personal references and be sure to follow up with them. Reviewing their social media and searching them on LinkedIn will help identify their professionalism and endorsements or awards from any prior employment. Finally identify your top three candidates and know which are the most valued. Make your decisions quickly and keep communication going, because waiting will only frustrate your potential new hires and give other employers the opportunity to make an offer first. Make an offer that will make them feel valued. Understanding what the market is paying is important, no matter the position. According to SHRM “New employee onboarding is the process of integrating a new employee with a company and its culture, as well as getting a new hire the tools and information needed to become a productive member of the team.” Onboarding begins immediately and includes setting first day expectations, making team introductions as well as setting the timeline for more training and formalities. Online applications such as Zenefits offer employees the ability to start their onboarding process online. Many payroll services such as Paychex also offer online solutions to help you streamline your hiring procedures. You have worked hard and many hours to find the perfect employee, now how do you get them to stay? People love to grow in their careers and the best way to facilitate that is to offer them ongoing training that enhances their position. Nothing is more wasteful than hiring someone and then not giving them the tools they need to succeed in their role in your business. From supporting your employees with your business procedures and giving them additional educational opportunities with online certifications, webinars or in house training, your new hires will value your investment in their growth. Employees have opinions and ideas and often they are on the front line of your business. They can see clearly the opportunities for improving some of your services or procedures. Many times concepts may be confusing to the newly hired or decisions made by management may not be clearly understood. Asking for feedback from your employees gives them a voice to be heard. If you regularly solicit feedback, your employees can offer you insight into the unseen challenges they may face or be the voice of your clients and help solve challenges before they become problems. The employees that you have hired are there to add value and expertise to your business. Helping your team clearly understand the mission of your business and how important they are in achieving the goals allows them to be engaged in delivering results. Communication is rarely overdone when setting expectations, timelines and projects. Remember communication is a two way street and starting the conversation is only the first step. Communicating clear expectations on the job function, timelines and goals helps eliminate any misunderstanding in the future. Employees want to succeed in their role. The best way to help them achieve success and growth is with regular reviews. It is crucial to identify good performance early in their employment. Try to start in the first few weeks of employment with positive reinforcement. Make any corrections early as well with the focus on positive reinforcement. While managing and hiring quality employees takes time, it is well worth the effort when you build a quality and high performing team, that results in achieving your business goals. Keeping a quality team and reducing employee attrition happens with strong onboarding, ongoing training and frequent communication. If your business is growing and you are overwhelmed with your Human Resource tasks and projects, let our Specialists help you recruit, hire and onboard top talent.